How, And Why, Some Farmers Are Bringing Livestock Back To The Prairie : The Salt Some farmers are grazing different types of animals on the same land in a carefully controlled pattern, which ideally will enhance animal welfare and also help regenerate the landscape. Farmer Wendy Johnson markets hogs, chickens, eggs and seasonal turkeys. She also grows organic row crops at Joia Food Farm near Charles City, Iowa. On a cloudy summer day, Iowa farmer Wendy Johnson lifts the corner of a mobile chicken tractor, a lightweight mesh-covered plastic frame that has corralled her month-old meat chickens for a few days, and frees several dozen birds to peck the surrounding area at will. Soon, she'll sell these chickens to customers at local markets. Johnson runs Joia Food Farm on land she rents from her family, which has a conventional corn and soybean operation near Charles City, Iowa. 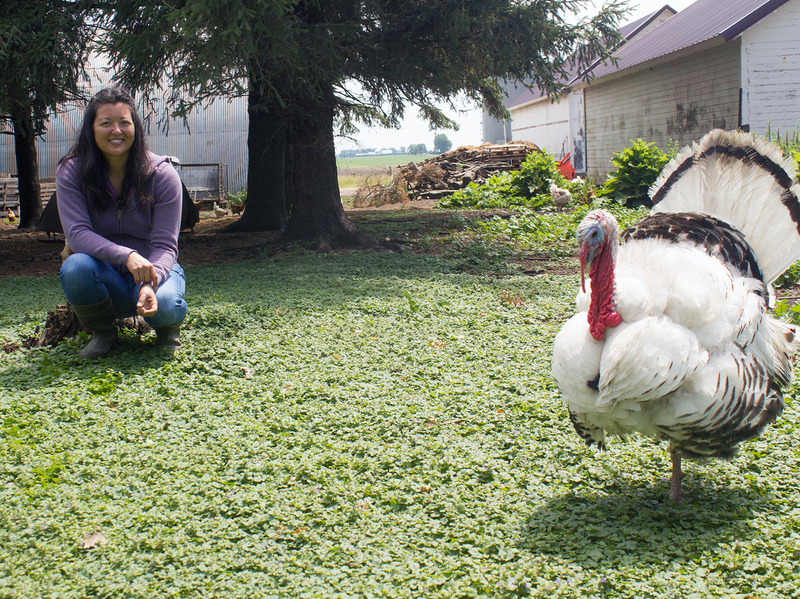 She transitioned some fields to organic for corn and soybeans but also raises several types of livestock. "Before we just let them out and day range, we make sure they know and understand that this is their home," Johnson says, "so they go back into it." From now on, the chickens will be free to forage and peck during the day. The portable coop will keep them safe at night. "I have watched them eat, they really love the tips of the new grass," Johnson says, "and the white clover flowers." Most of the meat in grocery stores comes from huge farms and ranches that gain efficiency through economies of scale, and bring us cheap burgers, chops and wings. Those farms can be rough on the environment, generating massive amounts of animal waste and depleting the soil. Johnson's approach relies on grazing different types of animals on the same land in a carefully controlled pattern, which ideally will enhance the land they roam. When used with several different animals, the technique is sometimes called multi-species grazing. Johnson plans to rotate sheep through a series of small paddocks, followed by the meat chickens. The animals will eat what they please and fertilize with their waste. Laying hens and turkeys roam freely about her farm and yard. And she plans for pigs to eventually graze on organic crop fields where their natural rooting behavior should help improve soil health. Farmers like Johnson are hoping creative approaches to providing meat, often at a premium, to customers who care more about farming methods than price will improve cropland and wildlife habitat while also helping them earn a profit. "A multi-species open pasture system has a higher level of animal welfare," says Will Harris of White Oak Pastures in Bluffton, Ga. "I believe it is more regenerative for the land and I think it benefits rural economies." Harris pasture-raises cattle, hogs, sheep, goats, rabbits and five types of poultry. It sounds chaotic, and Harris says it requires careful planning. Various types of animals prefer different plants, and some research has shown that this leads to a healthier mix on the landscape, compared to pastures that regenerate after grazing by just one type of livestock. This also means the pasture becomes more productive for raising sheep and cattle versus one or the other. These are not new concepts, but they do buck the current trend of specializing in one type of meat animal. To reap the benefits, Harris says, beyond managing the animals, a farmer has to be savvy about developing a market for high-end meats. Over 10 years, as he transitioned from a traditional cattleman to his current system, he has had to stomach short-term losses and manage millions of dollars in loans. "Today, it's cash-flow positive and profitable," he says. "Not obscenely cash-flow positive and profitable, we have to watch every penny, but it's working." Harris has gone from three full-time employees to 137 and his gross revenue has tripled, he says. Practical Farmers of Iowa invited him to speak to dozens of Midwest farmers, including Johnson, who wanted to see what lessons he could offer. In the Midwest and eastern Plains, farmers raise massive amounts of corn and soybeans to feed big livestock operations. In many areas, the prairie has been gone for decades. But grazing animals is possible here, says Adam Janke, an extension wildlife specialist at Iowa State University. He says "conservation grazing" is a real thing. "And these are these neat examples where people are using the behavior of domestic livestock to mimic, for example, what elk would have eaten or what bison would have eaten," Janke says, "or even to do totally novel things like control invasive species." Cattle, sheep and goats all can play a part. But Janke says when, where and for how long the animals graze needs to be carefully controlled. Moving animals through a series of paddocks, as Wendy Johnson does, is called rotational grazing. "Rotational grazing systems are really productive for wildlife because there's a combination of rest, recovery and grazing," Janke says, which can allow for a variety of native plants to grow back. That, in turn, attracts birds and pollinators and helps restore the area to something resembling the former tallgrass prairie. Johnson may never restore prairie, and she can't let her hogs roam freely as they do in Will Harris' Georgia woodland. His example, though, gives her hope that she can care for her livestock, restore soil health, attract wildlife and turn a profit. It's not just a dream, it's a business plan. This story comes to us from Harvest Public Media, a reporting collaboration focused on food and agriculture. Amy Mayer is a reporter with Iowa Public Radio.